Part of the smell of India is due to incense, frequently used everywhere to overpower other smells, especially during the monsoon season. Patschouli and sandalwood and many more scents come to mind. Incense is used in many religious rituals too. We have to distinguish between this use (incense, francincense, Weihrauch) and the use of incense sticks, joss sticks (Räucherstäbchen) for every-day fragrance purposes. My childhood days were so entwined with my parent’s devoutness and piety . . . their daily prayers in the prayer room – called the Pooja room – the agarbatti filling the silences in the songs my mother sang praising mother goodness – a scene still vivid and clear in my mind . 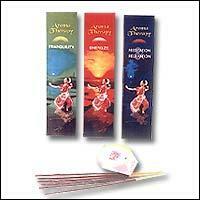 . .
Agarbatti is a small scale industry in India, each state having its many varieties of aroma sticks. Many use exotic blends of the evergreen forest – thus bringing nature into our homes! In India warmth and elegance is not only in the hearts of its people, it is in the air too. Floral Incense offers wide range of Incense, Incense Sticks, Dhoop, Agarbattis, Japanese Incense Sticks, Aroma, Cones and Coils that aromatize your surroundings. Weihrauch is usually only used in Catholic Churches. It is the sap from Boswellia sacra (Boswellia carteri). Frankincense Tree. Wild Boswellias grow in Somalia and in the Arabic Peninsula. Their resin, the frankincense, is collected during dry periods. The trees are tapped by making a 3 inch incision in the bark, or by scrapping some of it. Incense in Japan has been introduced together with Buddhism in the 5th century and been used during religious ceremonies for a long time. It seems to purify the holy space of a temple and pacify the mind of the worshippers to enable them to get a glimpse (should I say: a whiff) of the Beyond. But maybe only in Japan has the use of incense been elevated to the "Way of the Incense" (koodoo 香道), next to the Way of Tea, the Way of the Flowers, the Way of the Bow and so many other Japanes WAYs of enriching life with a sence of the true, good and beautiful (shinzenbi 真善美). There is a form of incense ceremony still practiced today known as Genji-kô (Genji incense). It is essentially a highly refined parlor game, based on one's ability to hold the olfactory memory of several different scents and tell them apart. The scoring system uses a set of symbols coded to 52 of the 54 chapters of The Tale of Genji. 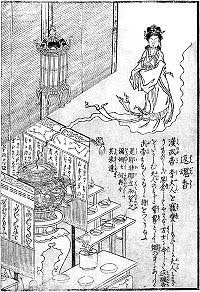 Despite the Heian-era overtones of its name, Genji-kô has nothing to do with the way incense was used during Murasaki's day. It comes, rather, from a tradition of incense guessing that was developed in the fourteenth century. These symbols, which have long since entered the realm of design motifs, are combinations of five vertical bars joined at the top by horizontal bars in different combinations. If the bars are connected, that means those scents are deemed the same. For example, five single vertical bars with no horizontals, would indicate that all five scents were different. This corresponds to Chapter Two of The Tale of Genji, "The Broom Tree.
. Reference : Patterns of Genji-Ko . PDF . Another important ingredient in Japanese incense is kyara (伽羅). Kyara is one kind of agarwood (Japanese incense companies divide agarwood into six categories depending on the region obtained and properties of the agarwood). Kyara is currently worth more than its weight in gold.
. WKD : Different Kinds of Incense お香の種類 . I have written extensively about the use and the culture of incense in Japan. Please read my three articles quoted below. The smell of incense can be very subtle and faint, so the act of concentrated smelling it is called "listening to incense" (monkoo, bunkoo 聞香, koo o kiku　香を聞く) in Japanese. Here the verb "KIKU (LISTENING)" in Japanese means to use all senses to appreciate one thing in its full potential and with all your attention. KIKU is maybe the change of the verb 利く, as in "tasting ricewine, kikizake 利き酒", meaning "appreciating" something. In Japan , where almost all are Buddhists, we use incense on every morning to pray to the ancestors . Of course I do it every morning. incense is a seasonal kigo in the sacramental christian churches. incense is used on special feast days during the year to enhance the worship service. on these days incense it used during the opening procession, at the time of the scripture readings, and sometimes the altar and the congregation are blessed with incense. There is the cut marker YA at the end of line 1. Basho was at a tea shop on the way to Ise shrine. A lady at the tea shop had asked him to write a hokku including her name, Cho 蝶Butterfly.
. Basho at Ise Shrine 伊勢神宮 Ise Jingu . long night, yo-naga, nagaki yo is a kigo for autumn. Ein Mönch vor der Wand. A monk before the wall. Rain thunders at the window. They are used everywhere to keep the mosquitoes away. ***** . hoshi no takimono 星の薫物 incense for the stars . I go out to buy some incense . . . This hokku was written at the beginning of the 9th month (October) in 1821, when Issa was living in his hometown. Issa uses a humorous colloquial idiom to sum up his year so far: he has neither farted nor scented his house with expensive agarwood incense imported from south Asia. That is, the year has been so-so, average, ordinary, nothing special. Like the proverbial glass that is both half empty and half full, this expression is somewhat vague and very sensitive to context. In terms of Issa's life when he was 59, does it suggest "not bad" or, rather, "could have been worse"? In terms of Japanese poetry, the tendency to understate things and the preference for humility in self-references also affect the way the hokku is read. The date of the hokku's composition is a bit odd. It is written in autumn, almost four months before New Year's Eve, but the hokku uses "year's end," a winter word normally referring to the 12th month, especially to the latter part of the 12th month. Issa doesn't write the season (winter) above the hokku, as he normally does when he writes hokku that are out of season, so he seems to be writing from within autumn. We can only guess, but perhaps Issa felt his year had been mediocre at best, and this hokku was a prayer that nothing worse would happen during the last third of the year. Stating things the way they are and then projecting them into the future is a powerful form of prayer. Looking at Issa's actual year in 1821, in the 1st month his infant second son Ishitaro was asphyxiated while he was strapped to his mother's back as she worked. It was not his wife's fault, and Ishitaro apparently made no cries for help, so no one was to blame, but Issa went into deep depression for a while after Ishitaro's death and wrote some dark haibun words about it. And in the 4th month Issa's wife Kiku came down with a bad case of gout that kept her in bed for four months. It was an ailment that would kill her two years later. On the other hand, Issa must have known his wife was pregnant again (with the son they would eventually name Konzaburo), and many of Issa's hokku were anthologized during this year. However, at the end of the year Issa writes directly about his condition in an appeal to the local tax authorities, asking them to lessen the amount of his assessed taxes because his life is so difficult. This appeal gives the impression that for Issa 1821 was a year full of nothing but "farts," and even subtracting for the special pleading he was probably doing, the appeal suggests that the hokku translated above may be fairly stoic, understated, and perhaps ironic. In addition to being a prayer, perhaps Issa wrote the hokku to keep himself cheerful in a situation in which various shades of disaster were becoming the new normal for him.